Hey look, a BFG! No, not the Roald Dahl kind. 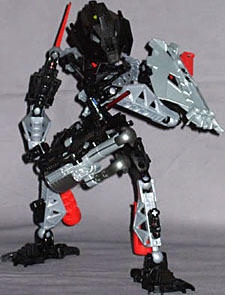 Wise and strong, Toa Onua challenges the mysteries of Karda Nui with his jet rockets, Nynrah ghost blaster, multi-resistant shield, Mask of Strength and high-tech wings. But can the power of earth prevail in a swamp filled with deadly foes? Jeez, are all these guys min-maxers? Pohatu, the big tough guy, is getting a speed boost from his mask, and now this guy with his giant gun is going for a strength increase as well - and not only that, but he's the "power of earth" guy and he can fly too. What happened to just picking a speciality and being happy with it? 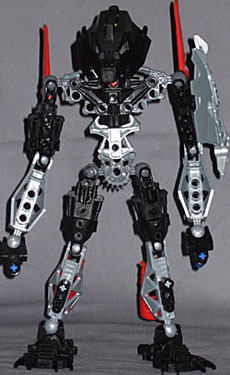 Then again, maybe the Makuta are notorious rules-lawyers, and the Toa are just keeping things level as best they can. 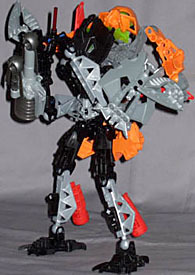 Unlike the Makuta doing battle in the Swamp of Secrets, who are all crazy insect monsters, the three Toa who got swamp duty - Onua, Gali, and Tahu - are all pretty run-of-the-mill Bionicle warriors, and the main difference between them is which bits of kit they've raided out of the weapons locker. Thus the articulation will be familiar to anyone who's owned one of these things: balljoint neck, shoulders, elbows, wrists, hips, knees, ankles. Onua stands out a little, thanks to an extra section of chest armour, and a serious-looking black/grey colour scheme overall that's a marked contrast to the other brightly-coloured Toa, but by and large it's the big damn gun that sets him apart. In fact it's just a Nynrah blaster, same as everyone else in the swamp got, but the addition of a single armour piece to the top of it rather cleverly turns the light-looking weapon into a mean, bulky death cannon, with a laser sight at the front and a fore-and-aft pair of grips like those on the Midak skyblaster. Onua's definitely the Jesse Ventura of the pack, with this being Ol' Painless. To complete the image of a walking machine gun nest, he's got asymmetrical armour on his upper arms, with the right arm inverted - armour on the back - to facilitate it being sharply bent to hold the cannon, and the left arm bearing a sizeable shield. A minor drawback is that, due to the necessity of leaving the forearm free to move, what the shield mostly protects is whoever's behind Onua. You could fix that with a couple of spare parts, though. Onua's mask is grim-looking - in fact, it's more than slightly reminiscent of that worn by Makuta Icarax (we'll get to him later), just a bit more angular and bulky. With the rear of the mask quite open it's easy for the head's eye-piece to catch some light, so his green eyes shine through the mask's eyeholes fairly well under regular lighting. Since he's a flying Toa of Earth, Onua also gets a few add-ons to make him at home in the air. Most obviously there are the wings on his shoulders - I'm not sure I'd follow the Toa Nuva Q Branch in calling them "high-tech," since they're titchy little things with no apparent value of their own, but I suppose they're handy for steering. Since he's not going to get off the ground by flapping them, though, he's also got his "jet rockets" (make up your minds, guys, one or the other), which are mounted on a neat little arrangement of pieces built into the shins that keeps the exhausts stable and pointing slightly away from the feet, so he doesn't burn his heels off. Onua's Matoran buddy is Photok, and they're the silliest pairing since Britney Spears and whichever backing dancer she's drunkenly married this week. Photok's bright orange armour undermines Onua's grim black, and clashes nastily with his red accents, and what with the shoulder wings and the mask's crest and the big shield on one side, there just isn't really room for anyone to hang onto his back. And since Photok and Toa Pohatu are among the few pairs that actually look decent when they're combined, it's really a good idea to leave Onua on his own. As I said earlier, Onua's not that remarkable by himself, but the gun and shield combo really does lift him - get them fitted, and put him in a suitably butch pose, and he'll do fine.